We bring you peace and tranquility through designs from nature. Please enjoy this slideshow of highlights and explore our website. You can enjoy a miniature living garden in your office, living room, kitchen or anywhere. These would be perfect for a reception area. Does your room need a lively splash of color? We can provide just the right touch. of many shapes and sizes. Our terrariums and tabletop gardens are very low maintenance and require minimal care. 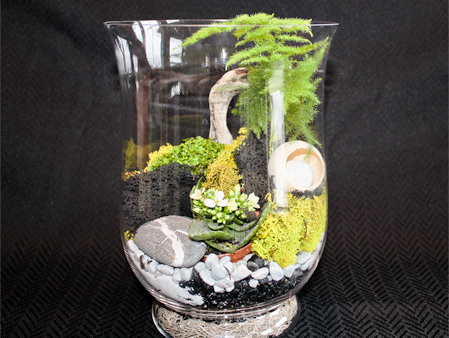 Terrariums can be designed to reflect one’s preferences for plants, colors, special art pieces and other component parts or to commemorate special days. Note: While these images are samples of our work, they might not represent actual items now in the gallery. Stock changes daily, so call or visit to see what's new. CP Creations © 2019. All Rights Reserved.